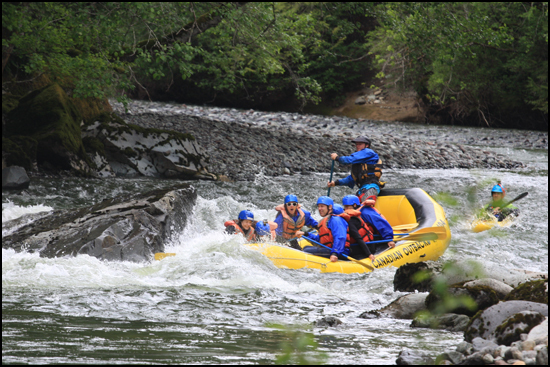 SQUAMISH, BRITISH COLUMBIA — The guide tells our group, “You are going to fall in the water. Every one of you.” He does it with certainty and in a dead-serious tone of voice that sets me shaking. I don’t like being in water, unless it’s warm, contained, and with a bar I’m able to swim up to. Dropping into cold water that’s racing for Mexico and dotted with jagged rocks whose purpose appears to be to crack the bones of anyone unfortunate or foolish enough to splash into the rapids isn’t my thing and never will be. As the guide details how he plans to retrieve each of us when we do fall into the chilly Cheakamus River — which he repeats again we are sure to do — I am thinking about hanging up my oar and making for higher ground. But a big part of a travel writer’s job description is attempting things not in one’s comfort zone, so readers like you can know what it’s really like before you set out for the adventure yourself. It’s kind of like the work a proxy would perform for medieval noblemen, tasting their food just to make sure it wasn’t poisoned. So, for you, I undertook my first white-water rafting trip, a two-hour thrill ride that was far safer than anything I expected and gave me a new appreciation for the soft-core adventures Canada offers. When your friends are in trouble and you’re far away there’s only so much support you are able to give. With Calgary, Canmore and so many other Alberta communities in grief, we wanted to do what we can at Vacay.ca to help. We are trying to ignite a Kickstarter campaign that will complement the Red Cross efforts to aid flood victims in need of financial assistance. But Kickstarter is only based in the United States and requires compliance with American tax law, so we are searching for colleagues south of the border to assist in getting it started. (Email us if you or someone you know can help.) Hey, if Gawker can raise $200,000 for a video of a fat mayor (allegedly) smoking from a crack pipe, there has to be enough human decency to raise the equivalent amount to help good people in need. 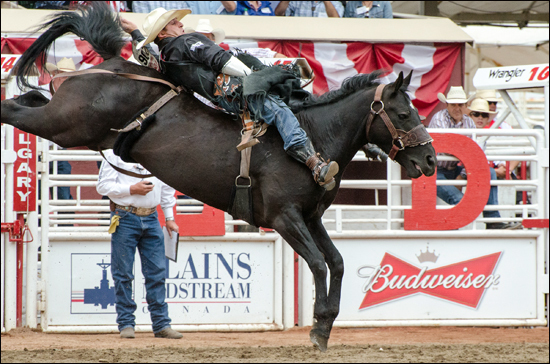 In the meantime, as we observe the historic flood and the damage it has done to this marvellous city and its neighbours, I wanted to list the great many things to celebrate about Calgary and southern Alberta. It’s a reminder of why you should visit, once the water has receded and the restoration has begun. When you first hear the term “Western Hospitality,” it’s easy to think it’s a marketing ploy. If you’re a journalist, you will even be keen to disprove the term or at least scrutinize its claim. Travel to Calgary a few times and you realize Western Hospitality is real and it’s real because the people of the city take the idea of welcoming visitors to heart. 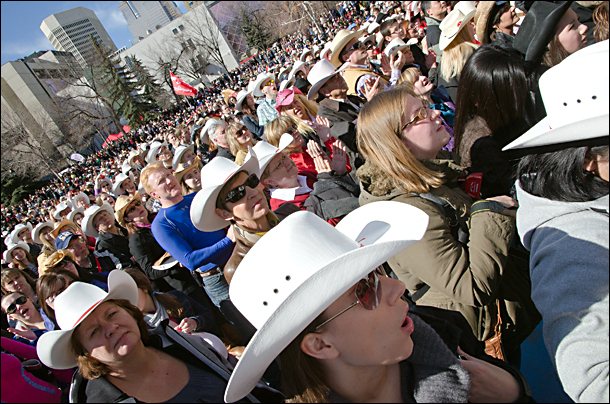 No city of 1 million people can match Calgary’s level of friendliness and gracious spirit. NEW BONAVENTURE, NEWFOUNDLAND & LABRADOR — Meet Bruce Miller. He lives here, in the land of his father and grandfather, a remote swath of territory with enough arable acreage, clean air, pristine water, and wildlife to inspire poetry and instill a will to depart only upon a last breath. A thoughtful Canadian, Miller flies the flag of Newfoundland outside his home, a small cabin overlooking British Harbour and Trinity Bay at the edge of the continent. In an island of Baymen and Townies, Miller is Bayman to the core, with a lilt in his brogue and a ready wink to go with his easy smile. He makes a meagre living as a fisherman and labourer and augments his income operating one of the most unique and riveting tours in Canada, taking visitors to communities affected by Newfoundland’s controversial resettlement. The itinerary includes a stop in his own home, for a cup of tea. “It’s the history that people seem to love,” Miller says on a wet day in September. He flips through picture books that show boats from a half-century ago trawling homes in a mass exodus that you would think only happens because of disaster or a plague. Among the photographs are some of Miller’s parents, who chose not to follow.